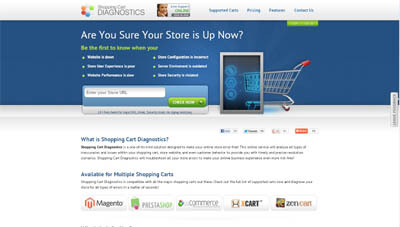 Shopping Cart Diagnostics is a one-of-its-kind solution designed to make your online store error-free! This online service will analyse all types of inaccuracies and issues within your shopping cart, store website, and even customer behavior to provide you with timely and precise resolution scenarios. Shopping Cart Diagnostics will troubleshoot all your store errors to make your online business experience even more risk-free! Shopping Cart Diagnostics is exactly designed to easily and automatically track, diagnose and identify yourwebsite availability and accessibility. You will instantly see whenever your store is down or unavailable. The service will provide further recommendations on how to act if either scenario takes place. This way, you won’t have to keep your customers waiting and will make sure they have everything they need at their disposal there and then!